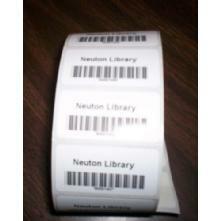 Neuton Data Systems - School Library Automation - Polypro Barcode labels (for books) . 1,000 labels for $22.00 - Special pricing for a limited time only! 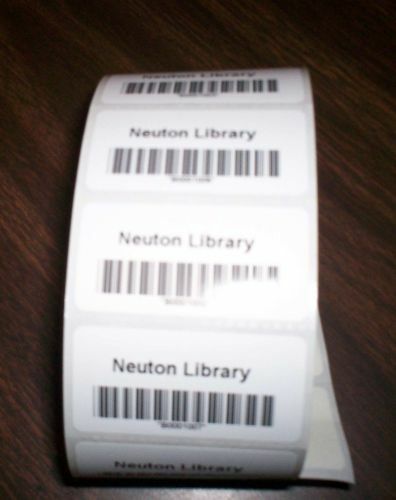 Polypro barcode labels (affix to library items) custom printed with name of your library and incrementing numbers("B0002345","B0002346", etc) (1,000 labelsl). Labels are 2" wide by 1" high. These labels are printed using premium wax/resin ribbon on matte topcoated white polypropylene label stock that produces high-quality black bar codes and human readable fonts. Features a high-performance permanent acrylic adhesive. No need to purchase label protectors when using these!